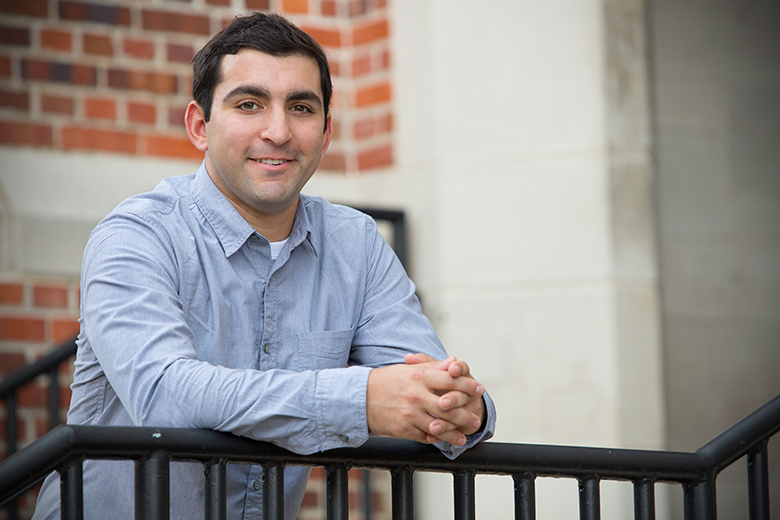 Florida State University graduate student Austin Schwartz is a true innovator. As the first graduate student to pursue both a doctoral degree in molecular biophysics and a master’s degree in business administration at FSU, the Greenville, S.C. native, is definitely unique. On the science side, Schwartz is working under the supervision of Professor Debra Ann Fadool in the Department of Biological Science, where he is researching the connection between olfaction and metabolism. The laboratory identified a target in the olfaction bulb, the part of the brain that deals with smell, that is tightly linked with metabolism. Members of the lab are seeking to better understand how metabolic signals can alter the sense of smell, as well as to determine if the manipulation of the electrical signals in this brain region can influence whole-body metabolism. “I have been working on developing a drug molecule that can more easily be delivered to this area of the brain as well as be tracked following delivery,” Schwartz said. With the assistance of Professor Hedi Mattoussi’s laboratory in the Chemistry Department, Schwartz was able to conjugate his drug molecule to trackable nanoparticles. “By being able to track this drug molecule we can both confirm that it is, in fact, interacting with our target of interest and better understand any potential non-specific interactions,” he said. Not only is Schwartz the first Florida State student to pursue this dual-degree program in biophysics and business, he’s encouraging other students to do so as well and has aided two other students to join the MBA program. Schwartz’ talent and dedication allowed him to secure a National Institutes of Health’s National Research Service Award, which provided three years of funding. He also successfully sought grant support through a National Science Foundation East Asia and Pacific Summer Institutes Award that sponsored him to travel to Australia last summer to collaborate with experts in drug synthesis. In addition, he has been awarded a Bryan Robinson Fellowship through Tallahassee Memorial Hospital, along with the FSU Legacy Fellowship and the Stanley and Shirley Marshall Endowment Fund Fellowship. In the Fall of 2015, Schwartz was selected as the People’s Choice Award winner of the FSU 3MT Thesis Competition. Schwartz also served as the president of the Molecular Biophysics Students for the Effective Communication of Science during the 2014-2015 school year. The organization provides molecular biophysics students opportunities to speak with their peers and a forum to work on public speaking skills. “Austin combines creativity and hard work with plenty of enthusiasm, a great quality in a graduate student,” said Mattoussi. Schwartz hopes to apply his experiences to translational science: science that has a clear ability to translate to human research and then to the marketplace. That’s where his MBA background will be the most useful. Following graduation Schwartz wants to pursue a career in biotech working for a small company to gain experience within the business side of science, and then ultimately, he hopes to start his own biotech company.